Firefox 16, now on the Beta channel, has a fantastic feature that was mentioned briefly in the Aurora 16 blog post and first introduced in a separate post by Joe Walker, the feature’s creator. We’ve devoted a sizable portion of the new Developer Toolbar to the “command line”, which you may sometimes see us call GCLI (short for Graphical Command Line Interface). The command line gives you quick keyboard control over your tools and access to features that don’t have any other user interface. To get to the Developer Toolbar and the command line, you can use the shift-F2 keyboard shortcut, or select Developer Toolbar from the Web Developer menu. If you want a quicker keyboard shortcut (this is a keyboard-heavy feature, after all! ), you can use the Customize Shortcuts add-on to override a shortcut that you don’t use. Personally, I hate having to reach for my trackpad. Removing my hands from the keyboard just slows me down. The problem is that it’s not easy to remember all of the keyboard shortcuts and traditional keyboard navigation is sometimes not as quick as reaching for the trackpad. Let’s look at how the new command line helps with this. Let’s say that I forgot the keyboard shortcut for the Web Console. I could reach for my trackpad and hit the Web Console button that is conveniently located on the new Developer Toolbar. Or, I can just remember the keyboard shortcut for the command line and run the command console open. Voila! The console opens. What I actually type to run that command is “con<tab>o<tab><enter>”, which is quick to type indeed. Want to see what else you can do with the Web Console? Type help console. I’m not even sure if there’s a keyboard shortcut for the Clear button in the Web Console. It’s easier to just run the console clear command than try to remember a seldom used shortcut. In the Style panel, we can now see that a media query with a max-width has taken effect and the font-size on the heading has dropped to 24px. We can also scroll down and see that the three columns that were side-by-side are now stacked. You could use the resize off command to turn off the Responsive Design View, or you could just hit <esc> a couple of times to get back to normal browsing mode. We’ve also added a handful of commands giving you some new and useful powers. Let’s take a look at a few of them. The output shows me all of the cookies that I have right now for this site. If I want to remove that cookie, all I have to do is type cookie remove WT_FPC or, if I think it’s easier, I can click on the “Remove” action listed next to the cookie and that command will be entered on the command line for me. I can also give myself new cookies using the “cookie set” command. The command line provides hints inline for each parameter. Pressing F1 gives me even more help about the current parameter. pagemod replace "Out of Date News" "The New Hotness"
See if you can spot the bits that go away. The “export html” command opens a new tab with an HTML snapshot of the current state of the page. The “addon” command lets you quickly enable and disable addons. This is useful for isolating an add-on that might be causing you trouble, or for keeping some add-ons that you don’t use often turned off. After that, use the “restart” command to restart the browser, and you’ll find that tools like Scratchpad have gained some extra powers for hacking on your browser. While many add-ons these days are restartless, you’ll find that there are still some popular ones that require a restart when enabling or disabling them, and the restart command is handy for that as well. One of the best features of command lines in general is that they are a very scalable form of user interface. Adding more commands does not add visual clutter in the UI you look at all day. Expect to see more commands in future Firefox releases, plus new commands that appear in add-ons. In a future command line article, we’ll show you how to create your own commands. It’s easier than you might expect! O_O This command line tool is awesome! I’m really excited about this new features! Well done Firefox! YESSSS I CAN NOW RESTART FIREFOX EASILY, SHIFT+F2, RESTART!!!!! I was way more impressed by the video demo than I thought I was going to be. Great work! Thank you, good to hear! Since these new “integrated” developer features first surfaced I have hard time deciding on the positioning of these new features – against the other tools, especially (the seemingly mozilla-endorsed) Firebug extension. I myself have tried some of these new developer features but always returned to the “good ol’ ” firebug, as some of the features (especially network & js/debug related) are essential for my daily routine (I understand that the developer extension is not aimed to satisfy needs of serious developers, at least not yet, in its current form/features), so I thought I’d ask: how exactly these new development-related features are planned/positioned in the future? Are these a hope-to-be-replacement-of-firebug-and-other-dev-tools for the Mozilla/Firefox platform, or simply someone had an idea for a gorgeous UI (as it _is_ gorgeous, I must admit) Firebug should have and someone else coded the backend – so anyway, what exactly is happenning here? Great questions and nicely phrased, thanks. A lot of work has been shipped since then. In that blog post, I mentioned “new approaches to developer tools”, and things like this command line are a part of that. Generally speaking, Mozilla values user choice. Firebug has more than 3 million daily users, and people have told me how much they love it. And that’s great. Our goal remains for Firefox to have an awesome set of built-in tools and add-ons for web developers. We want Firefox to be a great platform for web developers whether you’re building for desktop or mobile. Ideally, all of the common use cases for which people use Firebug will be handled well by tools that we ship with Firefox. But, the built-in tools are not a user interface clone of Firebug (obviously) and the intention is not to duplicate every tiny bit of functionality. So, if people prefer the way Firebug does things, they can use Firebug. Firebug benefits from the core work being done improving Firefox for developer tools (such as the new debugger backend or the mechanism that was added for locking in pseudo-classes). 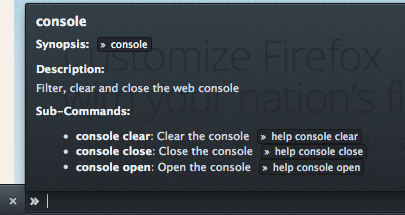 Likewise, Firefox benefits from the years of refinements and real-world use in Firebug. Well that sums it up nice, thanks! I’ll be looking forward the future features, keep up the good work then. Wow, those commands are very well made. You’ve set a high bar for extension writers :) Does this share any code with the old Ubiquity project? No, the code is not shared with ubiquity project. The concept is also different than ubiquity. The command line is just a tool to host, provide methods to create, and run commands. commands are made separately by developers and contributor, and ofcourse add-ons. allow addons to contribute new commands to this and it could be very cool. Shift+F2 doesn’t work using Nightly on my Mac. Have you tried holding down the Fn key as well? Why on Earth does Shift-F2 not close the GCLI once open? Neither does ESC, nor is there any command to close it. How are you supposed to do this other than my mousing over to the X and clicking on it (bleurgh)? We are still trying to see what works best. A lot of people reported the same feedback. We are working on improving that. You’re right that’s annoying. What should happen, but we’re not got it nailed yet is that shift+f2 should focus the command line if it’s not got focus yet (opening it if needed) BUT if the command line already has focus, it should close it. That should land in a week or so. It’s bug 773185 if you’re interested. I’ve got a BIG problem. Help Please!!! I pull up the new Inspector and then click to open the “Styles” panel and BAM it is now pushed off the right side of my screen. There is no way to see or close the “Styles” panel. I have to go to about:config to turn off the panel. Why is it being push off my screen? I can show you a screenshot if that would help? Best way is probably to file a bug so the developers can follow up on it. There you can also attach screenshots. Yes, a screenshot would help. Did you try to re-click on the “style” button? the “style” button gets pushed off the right side of the screen just like the “style” panel. I really dig the responsive design tester. And maybe you include this great tool in XULRunner? I’m curious to know if there is an actual CLI you can use in the same way. I’d always imagined a headless screenshot too that would allow me to debug page renderings across multiple machines much faster by running a command remotely on those machines. This doesn’t seem to allow for that without typing it in, or does it? Neat idea, but we don’t currently have any options for headless operation. The first question which immediately comes to my mind: will we get some “normal browser” commands (e.g., open, new-tab) and user-contributed scripts to run? That would kill vimperator/pentadactyl and fill my grieving needs for Ubiquity in one bang. We’re not planning “normal browser” commands right now, but an add-on could certainly add a bunch easily enough. Very nice feature, but have the memory leak problems been fixed? I can’t develop on a browser that freezes every 3 seconds. 2. Mozilla is constantly working to improve browser responsiveness, but we don’t have *all* engineers working on that. People have different skill sets and it’s not really possible to put everyone on the same problem (see Mythical Man-Month). Any plans to make the console scriptable? Is there a way to automate this? i.e. passing in commands to execute when invoking the aurora process? With all those debug tools directly embedded in Firefox, is the Firebug addon still﻿ useful? Firebug still has some features that have no built-in equivalents, and some people just happen to be used to and like Firebug. Wow, what a cool tool ! Is there a command to sum up the changes ? For example, as a web developper, I often edit the styles directly with the dev tools before applying them to the real CSS file. It would be caool if a tool could say me “add style … to [selector]” and so on. One thing I will note about CSS: if you’re working from files on disk, try out using the Style Editor because it is so quick and easy to make changes, see them live and then just hit save and you’re done! Will there be a button that we can drag onto our UI so we dont have to press shift-f2? I am not sure what would be the point of this … this is probably for people who prefer keyboard to a rodent. Can you link here this addon? Oh, Thats great nes for firefox user. I am using Google Chrome and Pale moon x64 bit version of Mozilla. i ill try this as soon it got relased! It would be cool if you could get the highlighted element when using the screenshot command. Maybe I am lazy but sometimes it is tedious to get the selector right. That’s a good suggestion. I’ll file a bug. Oi, these are some GREAT features. Thanks for sharing this stuff. Personally I still use Firefox. I think they have contributed TONS on moving the Web forward and I don’t know all of you, but I just dislike the idea of also letting Google know much of my browsing habits via Chrome. This is outstanding news, specially the RWD stuff. Screenshots are strictly forbidden on my site. Great!!. It’s an excelent idea. Just an idea, a prefix character eg. ‘ then the command line. A bit like the / command prefix for irc. I agree that would be very handy. One other idea which is probably beyond the scope of the project, but while we’re discussing “everything at your fingertip” commands, how about a system command line? I worked on a prototype earlier, probably in an amateurish wasy, but never got around to finishing it, using Gecko’s ability to launch files to run a batch file accepting arguments and then funneling the output to a file which Firefox read to be able to easily copy-paste command line output as well as input. One caveat is that occasionally the command history is a little buggy so I will need to find a workaround, but it does work, including tracking environmental variables for that session (which could of course be made permanent with more coding) and letting you change the color in the same manner as Windows allows in the console. We are using this for our website and it has been of tremendous help. It is far more useful than any paid software we are using for development of this website. Thanks for so much informative blog i am very excited for using firefox.I am using firefox since 12.x version and it freeze after working time or you can say after one house and after that if you restart firefox then again it works normal. Is this problem solved in this version of firefox. One more thing i am very curious about Firefox Command Line can any one give me command glossary of Firefox Command Line. I’ve been using something sort of similar since long through vimperator (single most useful FF plugin). A bit annoyed that I’ll have two command lines that work differently. I wish the new command line would include all the fantastic features vimperator already has, or that vimperator would find a way to plug into the new CLI to make use of it’s nice help system. diwaker: I work with a huge (I mean monstrous) web app that runs cross-browser. I develop using firefox and firebug and run a test system that is almost as big as the app itself which also sits insie the same instance of firefox. My firefox browser stays up for *days* at a time with no issues. Sometimes, though rarely, I may see odd behavior from firebug but even that is rare. Can I suggest you create a firefox profile just for development work and throw away ALL plugins (except perhaps firebug) and see if that fixes it? thanks Russ you have saved my valuable time. Now today i run my mozilla in 6 hrs in one go. When do we get to know about how to create custom commands? It will be awesome to have some of the common/most-used commands of Vimperator! Anyways, even this is amazing! My plan is to have the article about creating commands up before Firefox 16 final release is out (planned for early October). I’m looking forward to writing that article, but I’ve got some other things on my plate first. Responsive Design View is 100% amazing !!!! As for add-on vs. built-in, we have certainly considered those tradeoffs. The developer tools add a little bit of weight to the download, but that’s it. For now, we believe that the tradeoffs of having the tools ship with the product are worth that difference in download size. (I’ll note that the tools do not load until they are accessed… so there’s no cost in memory or performance). I am already working on writing some commands for basic user actions like open a new tab, close a tab, etc. Page scrolling is also a great suggestion. I have figured out how to write commands and its pretty simple. What I would want to have as a feature is the ability to create my aliases. I know I am talking more like a CLI geek but the truth is that I cannot write usable commands for everyone out there and vice-verse. So if it were possible to make aliases, I can easily use existing commands in other ways. Unfortunately, it does not look like there is any support for that in the GCLI project as yet. It’s great that you’re having good success building commands. You could probably create an “alias” command in an add-on, though it’s reasonable to imagine having that as a built-in. Would you mind filing a bug on that? So, someone has filed a bug for this already at https://bugzilla.mozilla.org/show_bug.cgi?id=760819. There is been some progress on it as well. “alias” command exists but they don’t execute newly created aliases as I can see from the comments on the bug. This will be great whenever it lands up in a release! Like it very much, especially the screenshot feature and resize window for mobile, tablets and other devices. Nice tool and features, but I’d liked it better as an add-on to firebug which have nice shortcuts for picking elements, close etc. Still a nice tool with some features firebug lack, like selecting an element and view the :hover css. Firebug can add features to this same toolbar/commandline. I’m hoping to see more mixing of features between Firebug and built-in Firefox tools. Any chance of being able to scroll through previous command like bash’s history? Any chance of having the screenshot command default to a timestamped filename, a la OSX? Thanks for the hard work! I love this! You should be able to scroll through history by hitting up arrow/down arrow. Sometime after Firefox 16 (I forget which release exactly, might be 17), the screenshot command defaults to copying the image to the clipboard, which is also quite useful behavior. Glad you like the new feature! Hi Nick, Actually, Firefox 18 (now Aurora) has a totally new screenshot command. If you use it without any options, the screenshot will be captured and saved to your downloads folder with the timestamped name a la OSX. You can also use the option ‘–clipboard’ to copy the screenshot to the clipboard. D’oh! Thanks, Girish! I remembered the addition of clipboard support, but forgot that the default was set to save with a timestamped name. I really wish I could use GLCI from windows command prompt. I’d be able to silently take screenshots with firefox from an app I’m developing. I was wondering if we can change the shortcut keys Ctrl + Shift + m – Opens Responsive design. Or else i want to disable/remove the web developer toolbar – Is it possible and How to uninstall/remove it? The web developer toolbar can be removed, open ‘about:config’ and set ‘devtools.toolbar.enabled’ to false. Yep, i was able to disable it.. and worked. Shift+F2 is the hot key for the httpfox plugin which I use literally every day. Neither Firefox nor the httpfox plug-in has any provisions (that I can find anyway) for changing the shortcut key used to activate each. Can you guys make a video tutorial for using the web-console, inspector, debugger. Specially for starter like me. Good suggestion! I’ll think about what we can do there. Thanks! Can you do it entirely on a white background while wearing turtlenecks and saying “magic” a lot? Ha! Thanks for the suggestion. I had a good time picturing it. Noe Nightly has the ability to record video, WebRTC ftw. Taras even blogged about the green screen demo using that. Marvelous, but only for developers. Why don’t you eliminate from Firefox all those tools we, common people, don’t need, and publish them as extensions? Please, stop making FF heavier. I love Chrome because of it’s agility. Sure it doesn’t have half the functionality of FF, but that’s because nobody (except devs and some few people who cant be considered the average public) needs it! We want a web browser, not a web developing tool. Please, make FF a web browser, ONLY; and make extensions with all those functions that web developers will find very useful, but nobody else does. For what its worth. Chrome has even more developer tools that Firefox (the timeline, audit tool, CSS profiler etc etc) And until you open the developer tools, they should have close to no impact on your browser to make it heavier. If you are worried about the size of the Firefox package, when you download it, then yet again, Chrome has more . Thanks for your comment. It has been more and more clear on how many web developers rely on tooling natively in the web browser, and that that is the best way to get the best performance for those. Google Chrome currently has, I would say, more developer tools built-in than Firefox has. But I do agree that more developer tools should not affect the performance or experience of regular users. Commands like console, dbg, break, edit, inspect, resize, tilt all are very awesome. As a developer all are very helpful to develop fast. Thank you for sharing such a great command. The “cookie remove foo” doesn’t work for me. It simply shows up again after I list, also after I reload the page. There is no way to set the cookie to empty string, either. These things work via the preferences.. I’d prefer to use the ‘CLI’ view, but it has to *work*. Also: the ‘+’ sign in an email address is *valid*, fix the validation.